VPNBook Review 2018 – Not a Secure VPN Service! VPNBook Review 2019 – Not a Secure VPN Service! Headquartered in Switzerland, VPNBook is a free VPN service, I would definitely not recommend to privacy-conscious users. The service does not offer native apps for platforms/devices, relying on the old-school OpenVPN client GUI. It lacks a large number of server locations and even keeps connection logs. To learn more about the service, read this in-depth VPNBook Review for 2019 by Best VPN! 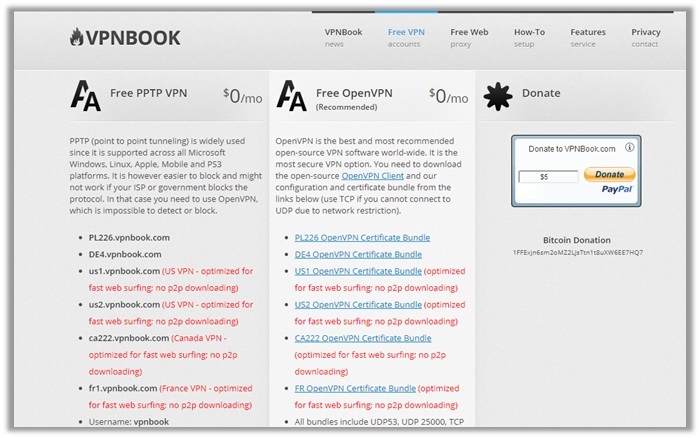 VPNBook is a completely free service. As such, you have no plans/subscriptions available. Users do not even have to sign up to use the VPN. If you click on the “Free VPN” tab, you will be redirected to the below page. 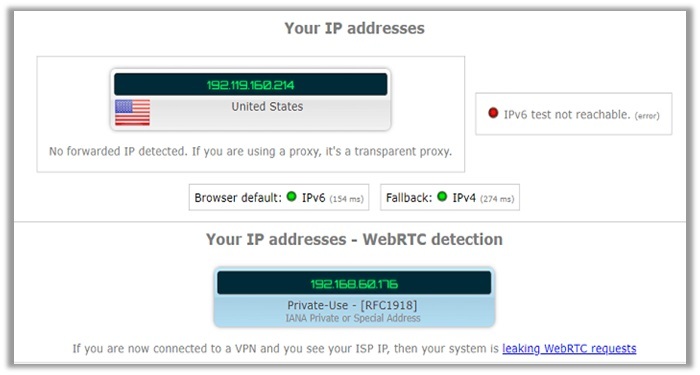 Here you have the ability to select the VPN protocol. Check out the vpn book alternative i.e purevpn price in this purevpn review. You typically have two options: Free PPTP VPN and Free OpenVPN. Below each protocol, you have a list of servers available with info specifying, if you can indulge in P2P or not. You have to load these servers in the OpenVPN GUI client. The username is vpnbook and password is e2bhr63. While VPNBook does not impose any pricing for its PPTP and OpenVPN protocols, you do have to pay for their dedicated IPs. Not that the service has a huge listing of static IPs available, but the standard pricing is $7.95 per month. Locations available: Canada, US East/West, and the Netherlands. Using VPNBook is as simple as loading a particular server in the OpenVPN GUI client. However, if you opt for their dedicated servers, you will have to make a payment. The options available from VPNBook include Visa, MasterCard, Maestro, Discover, and American Express! I do appreciate VPNBook offering dedicated IPs, as not many in the marketplace do. Another plus point about their static IPs is that you can avail a refund if the service is not up to the mark. Typically, you have 30-days until you can request for a money back, which is quite reasonable! 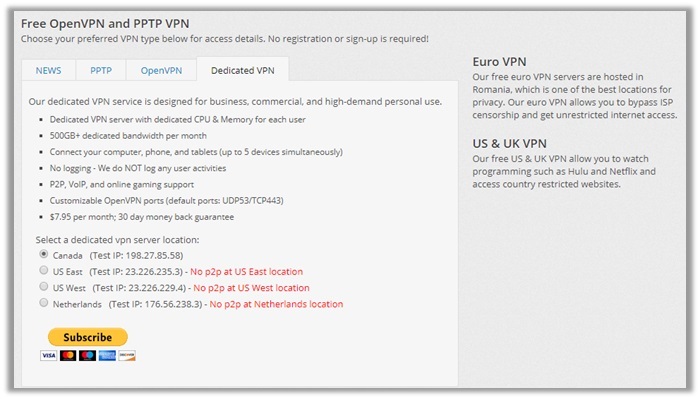 Since VPNBook is a free provider, its server listing is obviously not that impressive as compare to other vpn reviews. For its PPTP and OpenVPN Protocols, you only have selected servers available in US, Canada, and France. However, VPNBook does integrate Smart CDN fallback to improve network speeds. Many user reviews about VPNBook claim that the service offers good protection. While that may be true, since I detected no leaks, the VPN still does keep connection logs. Any provider that indulges in logging is definitely not safe, particularly those that claim they are “Free”. Bear in mind that managing a VPN service has costs for servers, update and maintenance, and support. As such, they use an ad-based revenue model for bearing the expenses. Therefore, you can forget about being truly anonymous with the VPN. Also, what is to say the provider does not sell your logging information to third-party services for money? As mentioned earlier, VPNBook only supports PPTP and OpenVPN protocols. If you use the PPTP, VPNBook integrates the outdated AES-128-bit encryption. However, users opting for OpenVPN, have the opportunity of configuring the encryption available from AES-128 and AES-256. Just like all other providers, VPNBook states that it does not store logs. However, this is farther from the truth, as they do store IP addresses and timestamps. That is all the information needed by government agencies and copyright trolls to trace your identity. Upon digging further, I discovered that they keep these connection logs for a week. Therefore, them being based in Switzerland makes no difference at all. If VPNBook receives a court order, they will have to hand over the logging information. Some anonymous users of VPNBook have even accused the service of being a honeypot. Many believe the provider is set up by US authorities to trap transgressors. There are have plenty of cases were logs of VPNBook turned up in trials. To get a better idea about the anonymity you receive with VPNBook, I decided to conduct a test on IPLeak.net. The site typically assess your connection to reveal any IPv6, WebRTC, or DNS leaks. We connected to a US server and the results were quite successful. 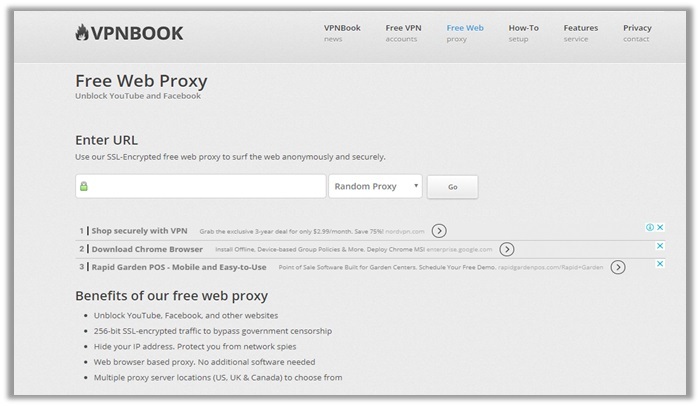 VPNBook also offers users a free web proxy. You can access it from the website directly or click on this link here. This is a good addition from the service, particularly if you just want to bypass geo-restrictions of different websites around the world. It uses 256-bit SSL-encryption! While the company itself has its headquarters in Switzerland, their support department is located in Zurich. There are no blogs available to guide you on issues with the VPN. You only have how-to guides for setting up PPTP and OpenVPN, along with a contact us page. If you need urgent assistance, the only two options you have is contacting them on Twitter and Facebook. 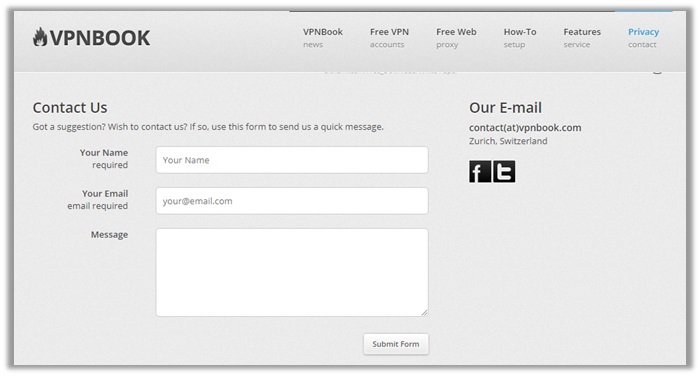 You can also email the support team at contact@vpnbook.com! If you ask me, I would not recommend this service to any individual. They might be free and that might be appealing to many. However, it is not worth putting your privacy at risk, particularly if you need a Cheap VPN to keep your identity hidden. I always advise users to go for premium VPN services, as they offer better security/encryption, remarkable server availability, and amazing features!